Wallis and Futuna, officially the Territory of the Wallis and Futuna Islands (/ˈwɒlɪs ... fuːˈtuːnə/; French: Wallis-et-Futuna [walis.e.fytyna] or Territoire des îles Wallis-et-Futuna, Fakauvea and Fakafutuna: Uvea mo Futuna), is a French island collectivity in the South Pacific between Tuvalu to the northwest, Fiji to the southwest, Tonga to the southeast, Samoa to the east, and Tokelau to the northeast. Though both French and Polynesian, Wallis and Futuna is distinct from the entity known as French Polynesia. Its land area is 142.42 km2 (54.99 sq mi) with a population of 11,558 at the 2018 census (down from 14,944 at the 2003 census). Mata-Utu is the capital and biggest city. The territory is made up of three main volcanic tropical islands along with a number of tiny islets, and is split into two island groups that lie about 260 km (160 mi) apart, namely the Wallis Islands (Uvea) in the northeast, and the Hoorn Islands (also known as the Futuna Islands) in the southwest, including Futuna Island proper and the mostly uninhabited Alofi Island. Since 2003, Wallis and Futuna has been a French overseas collectivity (collectivité d'outre-mer, or COM). Between 1961 and 2003, it had the status of a French overseas territory (territoire d'outre-mer, or TOM), though its official name did not change when the status changed. Futuna was first put on the European maps by Willem Schouten and Jacob Le Maire during their circumnavigation of the globe in 1616. They named the islands "Hoornse Eylanden" after the Dutch town of Hoorn where they hailed from. This was later translated into French as "Isles de Horne." The French were the first Europeans to settle in the territory, with the arrival of French missionaries in 1837, who converted the population to Roman Catholicism. Pierre Chanel, canonized as a saint in 1954, is a major patron of the island of Futuna and the region. The Wallis Islands are named after the British explorer, Samuel Wallis, who sailed past them in 1767 after discovering Tahiti. In 1917, the three traditional kingdoms were annexed to France and turned into the Colony of Wallis and Futuna, which was still under the authority of the Colony of New Caledonia. During World War II, the islands' administration was pro-Vichy until a Free French corvette from New Caledonia deposed the regime on 26 May 1942. Units of the US Marine Corps landed on Wallis on 29 May 1942. In 2005, the 50th King of Uvea, Tomasi Kulimoetoke II, faced being deposed after giving sanctuary to his grandson who was convicted of manslaughter. The King claimed his grandson should be judged by tribal law rather than by the French penal system. There were riots in the streets involving the King's supporters, who were victorious over attempts to replace the King. Two years later, Tomasi Kulimoetoke died on 7 May 2007. The state was in a six-month period of mourning. During this period, mentioning a successor was forbidden. On 25 July 2008, Kapiliele Faupala was installed as King despite protests from some of the royal clans. The head of state is President Emmanuel Macron of France as represented by the Administrator-Superior Thierry Queffelec. The President of the Territorial Assembly is Petelo Hanisi since 11 December 2013. The Council of the Territory consists of three kings (monarchs of the three pre-colonial kingdoms) and three members appointed by the high administrator on the advice of the Territorial Assembly. 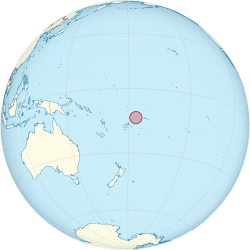 Wallis and Futuna is located about two-thirds of the way from Hawaii to New Zealand, at 13°18′S 176°12′W﻿ / ﻿13.300°S 176.200°W﻿ / -13.300; -176.200Coordinates: 13°18′S 176°12′W﻿ / ﻿13.300°S 176.200°W﻿ / -13.300; -176.200, (225 mi west of Samoa and 300 mi (480 km) north-east of Fiji). The GDP of Wallis and Futuna in 2005 was 188 million US dollars at market exchange rates. The territory's economy is limited to traditional subsistence agriculture, with about 80% of the labor force earning its livelihood from agriculture (coconuts and vegetables), livestock (mostly pigs), and fishing. About 4% of the population is employed in government. Revenues come from French government subsidies, licensing of fishing rights to Japan and South Korea, import taxes, and remittances from expatriate workers in New Caledonia, French Polynesia and France. Industries include copra, handicrafts, fishing, and lumber. Agricultural products include coconuts, bread fruit, yams, taro, bananas, pigs, and fish. In 1991, BNP Nouvelle-Calédonie, a subsidiary of BNP Paribas, established a subsidiary, Banque de Wallis-et-Futuna, which currently is the only bank in the territory. Two years earlier Banque Indosuez had closed the branch at Mata-Utu that it had opened in 1977, leaving the territory without any bank. Many exports include copra, chemicals, and fish. The total population of the territory at the July 2018 census was 11,558 (72.1% on the island of Wallis, 27.9% on the island of Futuna), down from 14,944 at the July 2003 census. The vast majority of the population are of Polynesian ethnicity, with a small minority of Metropolitan French descent and/or native-born whites of French descent. Lack of economic opportunities have since the 1950s pushed many young Wallisians and Futunians to migrate to the more prosperous French territory of New Caledonia, where, as French citizens, they can legally settle and work. More recently (since the middle of the 2000s), political tensions on the main island of Wallis (Uvea), due to a feud between rival aristocratic clans who are supporting competing kings, has led to a new surge of emigration towards New Caledonia and even the very distant Metropolitan France. At the 2014 New Caledonian census, 21,926 residents of New Caledonia (both born in New Caledonia and in Wallis and Futuna) self-reported their ethnicity as Wallisian and Futunian, which is almost double the total population of Wallis and Futuna. At the 2018 census, among the population whose age was 14 and older, 59.1% of people reported that the language they spoke the most at home was Wallisian (down from 60.2% at the 2008 census), 27.9% reported Futunan (down from 29.9% in 2008), and 12.7% reported French (up from 9.7% in 2008). On Wallis Island, the languages most spoken at home were Wallisian (82.2%, down from 86.1% in 2008), French (15.6%, up from 12.1% in 2008), and Futunan (1.9%, up from 1.5% in 2008). On Futuna, the languages most spoken at home were Futunan (94.5%, down from 94.9% in 2008), French (5.3%, up from 4.2% in 2008), and Wallisian (0.2%, down from 0.8% in 2008). At the same 2008 census, 88.5% of people whose age was 14 or older reported that they could speak, read and write either Wallisian or Futunan, whereas 7.2% reported that they had no knowledge of either Wallisian or Futunan. 78.2% of people whose age was 14 or older reported that they could speak, read and write French, whereas 17.3% reported that they had no knowledge of French. On Wallis Island, 81.1% of people whose age was 14 or older reported that they could speak, read and write French, whereas 14.3% reported that they had no knowledge of French. On Futuna, 71.6% of people whose age was 14 or older reported that they could speak, read and write French, whereas 24.3% reported that they had no knowledge of French. The overwhelming majority (99%) of the people in Wallis and Futuna are Roman Catholics, served by their own Roman Catholic Diocese of Wallis and Futuna, with see at Mata-Utu, a suffragan of the Metropolitan Archdiocese of Nouméa (New Caledonia). Fishing and agriculture are the traditional practices and most people live in traditional fate houses in an oval shape made of thatch. Kava, as with many Polynesian islands, is a popular beverage brewed in the two islands, and is a traditional offering in rituals. Highly detailed tapa cloth art is a specialty of Wallis and Futuna. In 1994, the territory had 1,125 telephones in use, had one AM radio station, and two television broadcast stations. Communication costs are high, costing up to ten times as much as western countries. The island of Wallis has about 100 kilometres (62 mi) of roadways, of which 16 are paved, while the island of Futuna has only 20 kilometres (12 mi), none are paved. The territory has two main ports and harbours, Mata-Utu and Leava (on the island of Futuna), that support its merchant marine fleet consisting of three ships (two passenger ships and a petroleum tanker), totaling 92,060 GRT or 45,881 tonnes. There are two airports, Hihifo Airport on Wallis with a paved runway of 2.1 kilometres (1.3 mi), and Pointe Vele Airport on Futuna with a 1 kilometre (0.62 mi) smaller runway. New Caledonia-based Aircalin operates the only commercial flights that go to Wallis, where it has an office in Mata-Utu. There are currently no commercial boat operators. There are 18 primary schools in the territory with a combined total of over 5,200 students; 12 primary schools are on Wallis and six are on Futuna. The territory has six junior high schools and one senior high school/sixth-form college. There is also an agricultural high school. ^ a b "LIVRET D'ACCUEIL Wallis et Futuna." 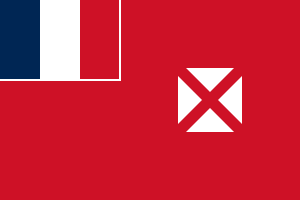 Wallis and Futuna. p. 22 (22/28). Retrieved on 14 September 2016. ^ "Cartographie des établissements du second degré." Wallis and Futuna. 24 June 2016. Retrieved on 14 September 2016.